Many thoughts and emotions are going through my head as I think about the hanus act that happened this morning in Newtown, Connecticut. I am having a difficult time putting into words how I feel about this tragedy. Just like the parents of the innocent little lives lost I said goodbye to three of my kids this morning as they headed on the bus to school. Each and every morning I trust that they will get to school safely and return home to me in the afternoon. I can not imagine my life without my beautiful babies. I’ll never understand why someone would even think about committing this terrible act. What was going through that shooters head this morning? We might never learn that answer. My heart is grieving for the families and friends of all the victims involved. With Christmas just around the corner it makes this tragedy even more sickening. In a couple of hours my three school-aged children will return from school. I am going to hug them just a little more tighter. When they head back on the bus on Monday, my views about their safety will not be the same as they were this morning. I can not even watch the news on this any more without getting sick to my stomach. 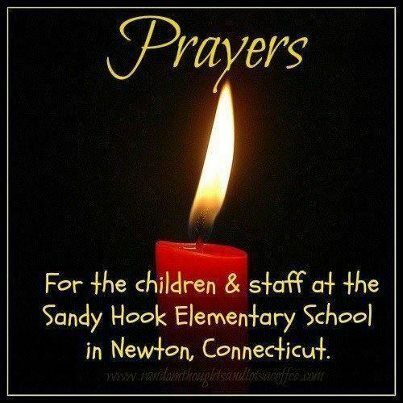 My thoughts and prayers go out to everyone in Newtown, Connecticut. I don't think there are words to accurately describe hoe horrible this was. I never actually wept over a news story before. My stomach is just sick. Those poor families. May God give them peace over time. I agree with you, bayctygrl. Thank you for visiting and leaving a comment.